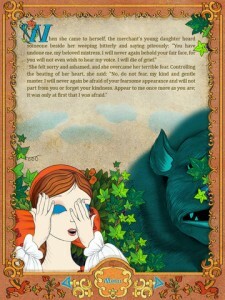 According to a popular animated retelling of the story, the fable of Beauty and the Beast is a “tale as old as time”. Surely, you know the story: Lovely young girl makes deal of one sort or another with ugly, smelly beast. Beast is lonely and ornery, Beauty tries hard to refine him. In the process, somehow, true love prevails between the two and with a health dose of magic, the two find their Happily Ever After. Just like real life, right? Scarlet Flower is an intricately illustrated e-book version of the same basic tale but told as a Russian variation. The actual story is similar enough to that well-known movie we all know; it is easily recognizable by kids of all ages. More importantly is the underlying message: Never judge a book by its cover. 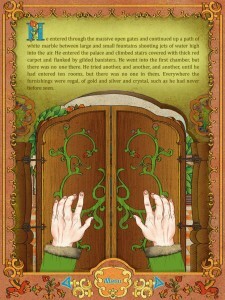 Taking the form of an interactive e-book, the story itself is long and without verbal narration. Non-readers will definitely need help from an adult or older friend, but that’s okay; the lack of narration promotes an open dialogue among the readers. Interactive “sparkles” within the tapestry-like graphics hint at interactive sounds and animations. Different mini-games help to break up the dense story line and keep children engaged and interested in continuing. A map with a sailing ship shows the challenging journey of the father in the story, and the iPad is tilted to help the ship gather supplies without running through obstacles like whales and rocky shores. A coloring page encourages artistic creativity and freedom, and a dress-up game appeals to girls as they can change the characters in and out of full gowns and gilded accessories and jewelry. Scarlet Flower is a refreshing version of the age-old myth of Beauty and the Beast, with a distinctly Russian twist. The pages of the e-book are so wonderfully designed with a globally precise aesthetic and just enough interactivity to keep kids reading and playing. For $3.99 this app should be a no-brainer to download, especially if you and your little ones are keen on story time. Non-readers will love sharing this app with their reading friends and family.